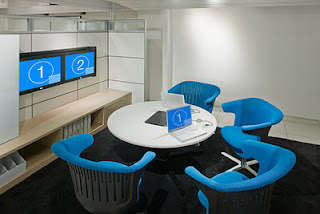 Through the integration of furniture and technology, media:scape is reshaping the way people collaborate in a connected world. Most collaborative work spaces today support leader-led presentations where information is controlled and shared by one person at a time. media:scape removes these barriers and democratizes how people access and share information by allowing all participants to contribute their ideas – equally, quickly and seamlessly. media:scape brings together people, space and information, to boost collaboration and help teams excel. This entry was posted in Uncategorized and tagged arbee associates, furniture, media:scape. Bookmark the permalink.